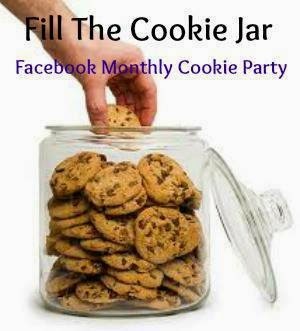 Welcome to October's "Fill the Cookie Jar"! This months theme is Halloween/Pumpkin. I had another cookie in mind for you for this event, but it was an epic failure! The more I think about that cookie, the more determined I am to go back to it and make it work. So, you may see it yet. Or we might never speak of it again. So... what to do for this month? I might not be able to remember my grocery shopping list, or remember where I put the new roll of paper towels, but I can remember when a friend posts a picture a year ago of a cute little Halloween cookie. So, after touching base with her about the recipe, and shaking off the dust from my previous failure, I was ready to try and make some eyeballs! Super fun recipe! I used a mix of cookie butter, and peanut butter, but you can certainly use all peanut butter. I would highly recommend if you have some little ones running around to have them ready to help you with the "blood". These set up really fast, so either work on a couple at a time, or have help! Once all was said and done, I wasn't sure what I was going to call these. But, then one of my awesome friends made a comment about the pic on facebook, I knew what their name was. Jeepers Creepers Peepers! Truckin' Man wanted me to tell y'all that "He's got an eye on you!" Line baking sheet with parchment paper, set aside. In large bowl, mix butter, cookie butter, and peanut butter together until completely combined and smooth. Add powdered sugar, half a cup at a time. Mixing completely after each addition. Take about two teaspoons of mixture and roll into ball. If mixture is to dry, add some more peanut butter. If to wet, and a little more powdered sugar. Roll all mixture into balls. Place on baking sheet. When completed, place baking sheet with balls in freezer for about 15 minutes. Meanwhile, melt almond bark in microwave following package directions. In small bowl, stir powdered sugar, with water together. Add food coloring, and water one teaspoon at a time, until desired consistency is reached (Test this with a toothpick on the side of your bowl. You want it thin enough so that it will run down the balls, but not so thin that it will run right off). Once you have the right consistency, set up your work station. Have a sheet of wax paper ready to make your "Peepers", melted almond bark, "blood", and toothpick or your choice of tool for the blood drizzle. Moving quickly, drop chilled peanut butter balls into melted almond bark. Set on waxed paper. With toothpick, drizzle red from center top of ball, down the sides. Set M&M on top. If the top is already set up, you can add a dot of almond bark to the M&M for "glue". ***Tip: If you are working alone, take 4 balls out of freezer at a time. When you complete those, repeat steps. Fun little truffle cookies for a party at home or in the classroom. So scary! Kinda looks like my eyes on Monday mornings lol! LOVE IT! This will be great. I will have fun with this and give the boys a scare. Thank you for the idea and recipe. Kris, these turned out awesome. They definitely are a fun Halloween treat that the kids will love. They look fun and adorable! Kris, these are great and a super Halloween treat... these would be perfect with the Candy blood I found. So fun! I made these with donut holes before but I love the idea of peanut butter balls instead. Oh what an awesome recipe! The title made me laugh out loud...perfect for this adorable treat. Thanks a million for sharing with us at Weekend Potluck. Hope you have a fantastic fall weekend. sounds like an awesome recipe!! But what in the world is "COOKIE BUTTER"????? Cookie butter is a spread, like a peanut butter or nutella, only it is made out of COOKIES! Delicious Brilliance. Trader Joe's Cookie Butter is heavenly if you have an opportunity to try it.